In Nizhny Novgorod, guests of the championship fall into the epicenter of cruise tourism. After all, the main tourist site of the city is the Volga itself, as well Volga landscapes, embankments, a port and waterways. The Volga defines the topography of the Lower: the right bank is the Upland part, the left - Lowland Zarechnaya. In Zarechie, on the Volga and Oka River, a new stadium has been constructed, which will host the 2018 World Cup matches. It stands practically opposite the Nizhny Novgorod Kremlin, and this did not save the Kremlin from the traditional confusion: in the championship booklet, instead of the Nizhny Novgorod Kremlin, a photograph of the Novgorod Kremlin appeared - that of Veliky Novgorod. Well, the Nizhny Novgorod Kremlin fans will be able to study "live": if you want, you can walk to the stadium from the stadium for about 50 minutes. The path turns out to be relatively long only because you have to get to the Kanavinsky bridge. Another historical monument, located right next to the stadium, influenced its external appearance - restrained, classical, with columns around the perimeter. This is the Cathedral of Alexander Nevsky, built in 1880. The area around the stadium is ennobled and landscaped. From the untrodden industrial zone, the Arrow turns into a pleasant walking area, united by a pedestrian boulevard. A 5-minute walk from the stadium, a new metro station is open, also Strelka. At the same time, other tourist areas are being modernized - for example, the Nizhny-Volzhskaya embankment, located under the Kremlin. And the fan zone of the championship will be located behind the Kremlin on the area of ​​Minin and Pozharsky, where 25 thousand people can come. 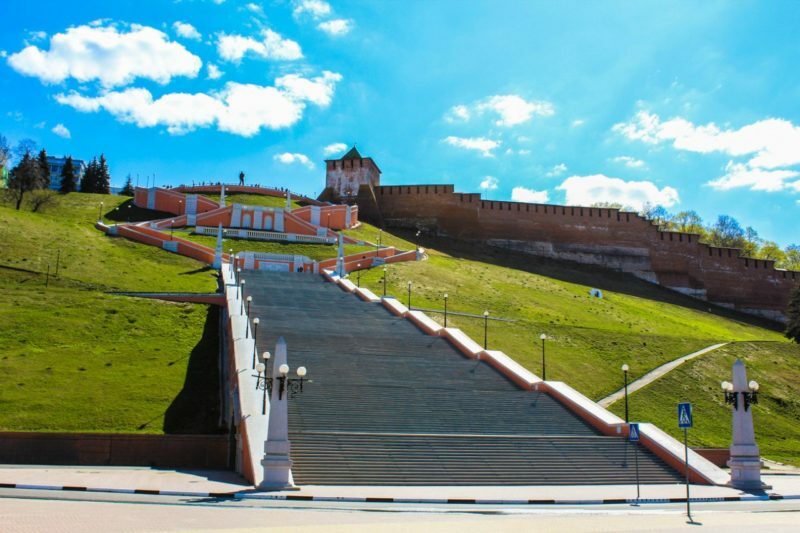 The Nizhny Novgorod excursion program offers the guests of the championship, firstly, five walking routes to historical places in the Mountainous part of the city. The fans will be able to enrich themselves with the knowledge about football "in the capital of the Great Volga", about the famous Novgoroders from Alexey Peshkov before Ivan Kulibin, about Nizhny's ties with the countries participating in mundialya. Pedestrian-bus tours expand the excursion geography to popular tourist sites in the Nizhny Novgorod region. Such, for example, as Semenov - the homeland of the Khokhloma painting. The football souvenirs of the master of JSC "Khokhloma painting" have already been prepared. In Rostov-on-Don, the stadium "Rostov Arena" is waiting for the 2018 World Cup guests on the left bank of the Don. This part of the city, known as Lewberdon, has a very special atmosphere, which they want to show the best of the guests. First of all, the left bank itself was improved to the championship: a new six-lane bridge with spectacular interchanges leading to the stadium was built, a huge park with a quay length of more than a kilometer was broken. And the rest of Rostov is ready to present the best examples of southern hospitality and the fruits of his fertile land. Guests will see them at the Old Bazaar of Rostov and in the winemaking museum, in the villages and towns of the Rostov region: routes are offered to Azov, Taganrog, to the centers of the Don Cossacks of Novocherkassk and Starocherkassk. For the fans organize walks around the Don, tasting local wines, fruits, Don fish and crayfish. The Rostov fan zone of the championship, designed for 25 thousand people, will open at the Theater Square. At the "Rostov Arena" will be matches of the group stage and the match 1/8 finals. Volgograd is a city of military glory, and the football championship is also covered by it: the stadium "Volgograd Arena" stands on the bank of the Volga at the foot of the Mamayev Kurgan. This is the place of the old Volgograd stadium "Central", which still remembers the fiery performance of the young Fidel Castro, who came to Volgograd in 1963. The leader of the Cuban revolution was given the a large area in the city and 60 thousand spectators with an official capacity of the stadium of 40 thousand. The new arena is designed for 45 thousand spectators. The main point of the tourist program for the 2018 World Cup guests will be, of course, a memorial on the Mamayev Hill, but not only him. Volgograd guides will show tourists both classic and unexpected sides of the city and its environs: you can take a boat trip or rafting on the Volga and the Don, or you can search for meetings with ghosts in the unique museum "Old Sarepta". The fan zone of the World Cup 2018 will unfold on the Central Embankment of Volgograd. The entire embankment for a month will turn into a festival site FIFA: it will install a giant screen, will open the stores of partners FIFA, the headquarters of the volunteers of the championship and the press center, cafe and other necessary items.